As Dickerman tells the story, abstract art is a prescription rather than a permission. This is a terrible mistake. She is fascinated by work by Mondrian and Malevich, where at least for a time it seems that abstraction is a way of limiting and thereby intensifying the possibilities of painting. She banishes from the exhibition Paul Klee and Joan Miró, two seminal figures whose profoundly abstract visions did not exclude “recognizable subject matter.” What Dickerman cannot admit is that abstraction in fact released painters to approach experience in an extraordinarily wide variety of ways. Dickerman weaves so many fascinating strands into her story that some museumgoers may not even notice what has been left out. She has found a remarkable early abstract painting by Vanessa Bell, a compact composition of rectangular forms that has a blunt, pragmatic integrity. And although she could have perhaps done with a little less Georgia O’Keeffe and Marsden Hartley, Dickerman is right to emphasize how early and how forcefully American artists come into the story. The trouble with the way Dickerman tells this story, however, is that abstraction becomes too much of an absolute. She emphasizes the nobility of artists who were either on the verge of entirely banishing recognizable subject matter or had already done so. 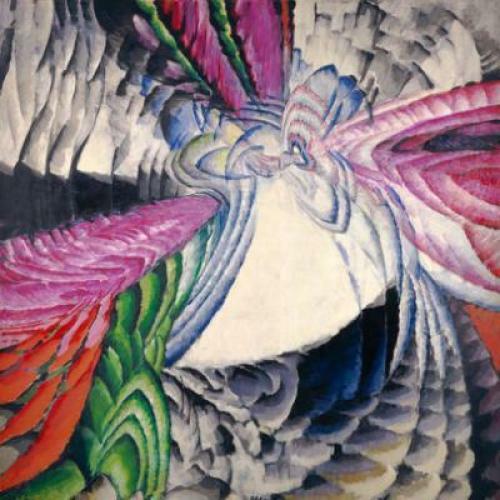 But abstraction, which arguably originated with the symbolist impulse in late-nineteenth-century art, was always less a matter of banishing reality than it was a matter of creating new realities, each of which had its own relationship with what the painters who in the nineteenth century set up their easels out of doors referred to as reality. In order to maintain the scheme of “Inventing Abstraction,” it sometimes seems that Dickerman is forced to willfully ignore the evidence before her eyes. If Miró and Klee have been excluded for the sin of recognizable subject matter, then why is it that Léger’s Les Disques, with its evocations of machinery and wrought iron, makes the cut? If “recognizable subject matter” has been banished, how is it that so many of the works in the exhibition contain letters or numbers, which are recognizable to any child? The absolutism that this exhibition imposes on abstract art is not an absolutism that many of the artists embraced, at least not for very long. Arp, one of the heroes of Dickerman’s story, spent his later years carving abstracted human torsos in marble, neoclassical visions that owed as much to Ancient Greece as to cubism and abstract art. Mondrian in the 1920s and 1930s did paintings that excluded pretty much all associations with the recognizable world, yet when in his later years he titled paintings Place de la Concorde, Trafalgar Square, and Broadway Boogie Woogie, I think you can certainly argue that he was encouraging his audience to recognize some fundamental relationship between abstract form and particular local realities. If Duchamp was a critical figure in the history of abstract art—and this is the formulation of Dickerman’s that strikes me as most wrongheaded—what does she make of the readymade, which is arguably the most realistic of all works of art? As for Klee and Miró, the two most egregious absences from this exhibition, they believed that abstraction liberated the artist to embrace nature—or “the nature of nature,” as Klee put it—in a whole new variety of ways. Dickerman would perhaps file Miró under Surrealism, which many would say is itself a form of abstraction. And she did apparently intend to have one Klee in the exhibition, his Homage to Picasso, although the truth is that Klee should have been as central a player in this exhibition as Léger, Malevich, or Arp. The longer I consider the exclusions of Miró and Klee, the more difficult they are to comprehend. Some will say that “Inventing Abstraction” reflects an old orthodoxy at the Museum of Modern Art, where sometimes (although by no means always) abstraction has been regarded as a one-way street leading to ever increasing purity. But if MoMA’s vision of abstraction embraces the work of the Abstract Expressionists, then it makes no sense whatsoever to exclude Miró and Klee, whose richly poetic understanding of the content of abstract art left such a deep impression on the American avant-garde in the 1940s. Leah Dickerman’s enthusiasm for the work that she embraces here is so heartfelt that it can’t but be infectious. When she places the dark silhouette of Brancusi’s Endless Column before a wall of preternaturally lucid paintings by Malevich, she produces a theatrical effect that museumgoers are going to remember long after this show has closed. And it is pure dramatic genius to set Tatlin’s Monument to the Third International under a skylight, so that the thrusting form seems to be taking off into the stratosphere. Yet in this instance the brilliance with which Dickerman puts together an exhibition—and we have seen it before, with her involvement in exhibitions devoted to Dadaism (when she was at the National Gallery) and to the Bauhaus and the murals of Diego Rivera (at MoMA)—tends to tie the story all too neatly together. The technique of dedicating parts of galleries or entire galleries to work done in particular geographic localities, which brought coherence to heretofore chaotic material in her great Dada show, makes the story in “Inventing Abstraction” look more logical and seamless than it really was. At times, by shifting from one country to another, she seems to be trying to draw our attention away from what might be uncomfortable thoughts. Léger, one of the heroes of her story, would be painting figure compositions well before Dickerman’s closing date of 1925, but before we can even consider that uncomfortable fact we’ve been whisked off to Russia and Malevich’s abstractions. And so it goes. Considering that many of the artists Dickerman includes had at best a passing interest in her definition of abstract art, you might think Dickerman herself would have begun to ask a few questions. The problem begins at the very beginning of the show, when in the label for Picasso’s Woman with Mandolin, Dickerman quotes Picasso’s famous statement: “There is no abstract art. You always have to begin with something.” For Dickerman, these are fightin’ words, dividing the non-abstract artists (beginning with Picasso) from the abstract ones. Interestingly, Dickerman does not include Picasso’s next line, which in fact complicates the story because what he says is that in the end “you can remove all traces of reality.” In a catalogue essay, the well-known scholar Yve-Alain Bois makes the same point even more aggressively, proclaiming Picasso’s “loathing of abstract art.” My feeling is that both Dickerman and Bois are drawing the lines a little too sharply. Picasso was quite evidently fascinated by Mondrian’s most radically simplified compositions of the 1920s, a fascination reflected in the white expanses, black lines, and primary colors in his Painter and Model series of the late 1920s. And as for the revolutionaries who are the subject of “Inventing Abstraction,” as I moved through the show I found myself coming back to Picasso’s statement, because more often than not the artists were precisely “begin[ning] with something.” If Dickerman really believes what she says, why on earth has she included photographs by Alfred Stieglitz and Paul Strand, which merely look at recognizable sights in a fresh way? As for the interesting emphasis that Dickerman places on the art of dance—with vintage footage of modern dance performances toward the end of the show—this also raises serious questions about the exhibition’s basic assumptions. Modern dance, with its dramatic reconsideration of the human body’s potential for movement, might be said to be the most realistic art of all, grounded as it is in an exploration of immediate physical experience. Perhaps the point of modern dance was not to regard the body abstractly, but to regard the body in a radically different way than classical ballet, which is arguably the more abstract art in that it imposes on the individual an ideal order, a physical discipline in many respects highly impersonal. By comparison, the modern dancer Mary Wigman, seen here in a performance from 1930, establishes a veritable cult of personality—a naturalism or an expressionism, take your pick, grounded in her own private reality. Dickerman is on far more solid ground when she turns to the relationship between the visual arts and music, a theme at the very beginning of the exhibition, where Vasily Kandinsky and Arnold Schönberg are paired. It is true that music is the most inherently abstract of all the arts, and certainly provided a model for many painters, going back to Fantin-Latour in the nineteenth century. But even here the situation is more complex than Dickerman may allow, because the avant-garde interest in music was also an interest in the Wagnerian unity of the arts—in Gesamtkunstwerk—and even as this encouraged the abstractness of the visual arts it encouraged new forms of symbolic storytelling and image making, which deeply affected the subject matter of Klee, Kandinsky, and many others. The more I think about “Inventing Abstraction,” the more I find myself arguing with its fundamental assumptions, but the pleasure of the argument is grounded in the intricacy and solidity of Dickerman’s work. Like the great Museum of Modern Art shows of the past—like “Cubism and Abstract Art” (1936), “Dada, Surrealism and their Heritage” (1968), “Primitivism’ in 20th Century Art” (1984), and “Picasso and Portraiture” (1996)—“Inventing Abstraction” challenges us to think our own thoughts. I am left thinking about how often the will to abstraction returns us to representation of one kind or another. I am left thinking that a broader definition of abstraction—a definition that fully embraced the achievements of Miró and Klee and the later work of Kandinsky (which with its symbolic forms may strike Dickerman as insufficiently abstract)—would make it easier to see the art of the twentieth century as a whole. And I am left thinking that a more honest and inclusive view of early modernism would render irrelevant all the talk of postmodernism, because so many of the values we tend to associate with postmodernism—narrative, symbolism, heterogeneity—are in fact aspects of early modernism. As for Picasso’s comment that “you always have to begin with something,” this may reflect not so much a rejection of abstract art as a rejection by this supremely pragmatic and skeptical artist of the spiritual longings that were so often associated with abstract art. The fact is that every artist in “Inventing Abstraction” began with something, even if that something was only a rectangular shape. The invention of abstraction was not about replacing something with nothing or craft with idea (as Dickerman would have Duchamp telling us). Abstraction was the new reality. Apparently we are still catching up with that reality.